The same classic analog chorus pedal that Kurt Cobain and Adrian Belew relied on to create their signature sounds. "Here's a short experimental video by Radiohead's Thom Yorke -- look carefully, and you'll spot his Frequency Analyzer, Stereo Polychorus, and Big Muff Pi." *Premier Guitar* continues their list of pedals that Aaron uses, next up the Electro-Harmonix Stereo Polychorus. 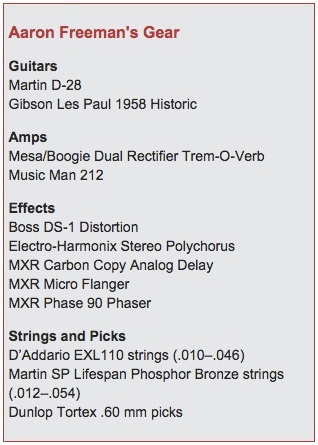 [Source](http://www.premierguitar.com/articles/21257-aaron-freeman-return-to-form?page=3). In this 1996 Guitar Player [interview](http://www.robinguthrie.com/interviews/guitar-player.php), Robin Guthrie says: "on 1983's Head Over Heels, some of the guitar sounds were played through an Electro-Harmonix Poly Chorus, which has a feedback control. If you turn up the feedback control as you're playing, the unit starts to take off by itself. I could stop playing after a while and the sound would just carry on." Used during King Krule's NPR Tiny Desk performance. Photo taken at the Astoria in Vancouver, BC, Canada. May 9th 2018. 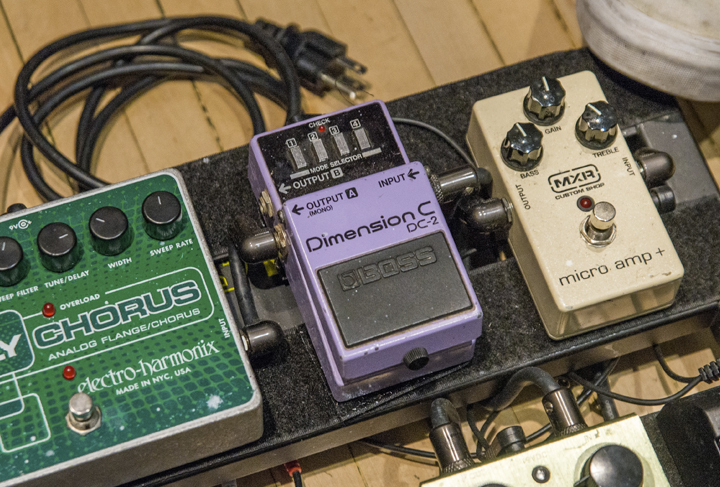 In an image accompanying [this interview with Reverb.com](https://reverb.com/news/drab-majesty-talks-chorus-pedals-casio-synths-and-the-selfless-act-of-songwriting), Andrew Clinco's pedalboard includes a Poly Chorus reissue. The Electro-Harmonix XO Stereo Polychorus Analog Flanger and Chorus Guitar Effects Pedal produces a wide variety of tones, from mellow to maniac. It's the same classic analog chorus pedal that Kurt Cobain and Adrian Belew relied on to create their signature sounds. The Stereo Polychorus provides the lushest stereo chorus, rich chiming flange, and the over-the-edge effects that made this versatile pedal legendary. FILTER MATRIX- A comb filter, which creates "chime" effects. In this mode you can sweep the TUNE knob manually for "custom" flanging. FLANGE - A sweeping comb filter which creates a variety of modulation effects and whooshing sounds. CHORUS- A sweeping echo for moving sounds such as "12 string guitar" and rotating speaker effects. DOUBLE TRACK- A short-delay echo for spacious "stage effects". Everything from warm lush flange chorus to robotic filter matrix to oscillating ufo sounds. The Cobain sound is there but it's not a sound I use often. it's quiet easy to dial trippy unique sounds out of this thing leaving a sonic fingerprint on any music you play. Love this pedal and regulary use it in my rig. The only downside for me is it can take up valuable space if you like to squeeze a heap of pedals on your board. I use this pedal to make the craziest noises possible. how is it at regular chorusing? is it tonally similar to your small clone?